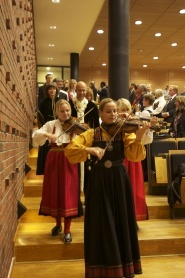 The Norwegian University of Life Sciences (UMB) honours the doctors who were awarded their doctoral degrees during the academic year 2012/2013. The graduation ceremony will be held in the Arabidopsis Auditorium in the Biotechnology Building and is open to everyone. Dress code - semi formal. UMB wishes to thank all doctors for their effort and contribution to UMBs research. The graduation ceremony is open to everyone wishing to participate. The ceremony starts in Arabidopsis auditorium in the Biotechnology Building at 2 p.m. on Friday 11 October and ends approximately 4 p.m., when the doctors and their invited guests proceed to the banquet in the Economy Building.